Light: Donating your time and talents to others. Taking satisfaction in knowing how your efforts will aid others. Creating a “win-win” scenario. Giving even when you know repayment is not possible. Being motivated to do a good deed. Shadow: Linking your sense of self-worth to the appraisals of others. Striving to appear more needy than you really are. Taking undeserved or unmerited charity. Bragging about your charitable efforts. Profiteering in times of distress. Refusing to share a burden. Story: Defying conventional wisdom, the Main Character lends his or her support to a hopeless cause. Relationships. We like to say relationships involve give and take; this card invites you to focus on giving more than receiving. Watch for opportunities to take on chores that neither you nor your friends (or partners) enjoy. Surprise a loved one with an unexpected, unmerited gift. Work. Most people focus on profit; what might happen if you focused on giving instead? A gift given with strings attached deserves a skeptical response. When charitable gestures are revealed (or perceived) as bribes, don’t expect good results. Spirituality. Few things energize the weary spirit like service. Volunteer. Lend a helping hand to someone in need. Give of your time, your money, and your talents—all three. In helping others, you help yourself. Personal Growth. When you can give something without expecting anything in return, you’ve reached an important milestone. Accelerate your quest for maturity; practice giving with no thought of what’s in it for you. Fortune Telling. A stingy spirit is strangling your enjoyment of life. Loosen up and think of others for once, why don’t you? When? Between November 2nd and 11th. The Exchange. 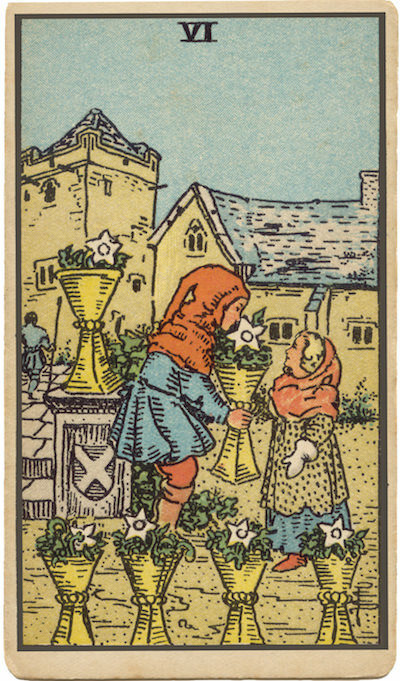 On many versions of this card, one figure passes a bouquet to another. Was money involved, or was this a free gift? How might expectations of payment (or repayment) be shaping your own situation? Giving Gifts. What attitudes and emotions would motivate such an action? How might these attitudes and emotions play a role in solving your dilemma? What dictates the value of a gift? The Marseilles Image. The cramped configuration of the Five has given way to the orderly balance of the Six. When emotions and spirituality are properly aligned, they become a channel for healthy growth. What gifts do I possess? How freely do I give them? How can I practice unconditional giving? How would things change if I became a more charitable person?